Eileen Dunne and her husband Stefano Crescenzi didn’t start out their careers in the foodie business but in Fine Art and Economics in Rome. However, when they came to live in Ireland in 1995 they realised that there was a huge gap in the market for casual dining Italian style – the sort of enoteca where you could get a glass of wine and maybe a spot antipasti all day long. So Dunne & Crescenzi was born in South Frederick Street. I remember writing an article on them shortly after they opened when it was really more a wine shop and deli with just a few little tables now it could be said that their Roman Empire proved so successful that it is now part of Irish life. Sandymount is a smart superb of Dublin which was badly in need of a few eateries. When Dunne & Crescenzi opened there it was an instant hit for breakfast, lunch and dinner. The atmosphere is rustic with wooden floors, and tables, and the walls are lined with gorgeous vino. It is absolutely perfect for that casual relaxed bite all day long and for fun memorable evenings with plenty of chat and laughter that are not spoiled by a huge bill at the end of the night! You can have Piatti Freddi - Antipasti selections of cold meats, marinated vegetables and cheeses in all sorts of combinations from about €8.50 to €13. Prosciutto S. Daniele is San Daniele cured ham with fresh spinach leaves, radicchio saland and Grana Padana mature; Tagliere della casa is a selection of typical Italian salumi with farmhouse cheese garnished with preserves and served with white bread. They do bruschetta with different toppings from €5.50 and posh panini with various fillings for €7.50 and they also do lovely fresh salads with combinations of artichokes, asiago cheese, semi sundried tomatoes, cannelini beans, goats cheese, tuna, black olives, and other Italian goodies all drizzled with Balsamic vinegar and extra virgin olive oil. They have a special range of mozzarella salads combined with whatever is your hearts desire – one dish is with smoked ham from Trentino, another with Parma ham and pesto dressing, or maybe you like your mozzarella with chargrilled vegetables – all come with warm bread. If you are a salumi purist, D & C import their own artisan salumi so you can indulge in a plate of Salamino Piccante Napoletano which is with chilli or Salmino al Tartufo with truffle. There is one flavoured with Barolo wine and anothr made with wild boar meat. These range from €15/€17 and come with toasted bread and rocket salad. 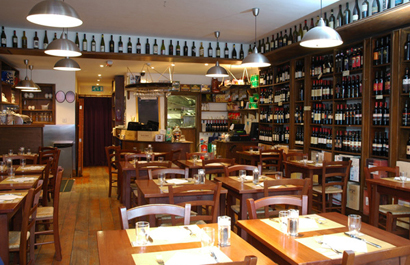 They also do delicious pasta and risotto, meats and fish, priced from €9 upwards to about €24. You can have a main course of risotto made from Arboria rice with lamb, herbs, leeks, Parmesan, butter and white wine or maybe Tuscan season sausage with Borlotti beans in a rich tomato sauce. Seabass is with leeks, tomato, thyme, garlic and bayleaf and a choice of contorno; organic Irish lamb chops are with roasted rosemary potatoes, and they even do delicious grilled fillets of beef. Breakfast is available up to 12 noon Monday to Friday and up to 2 p.m. on Saturday and Sundays – very handy. Price run from €6.50/€8 and tht includes a fruit juice or tea or coffee. You can have croissant with organic scrambled eggs and ham; panino with Italian sausage, roasted peppers and goat’s cheese; scrambled eggs with smoked salmon……the list goes on. I wish they would open in Dun Laoghaire……or Blackrock….or Dalkey….or Monkstown. We feel deprived.